It has long been believed that SMT stencil nanocoatings were needed to help release solder paste from small apertures, which is 100% correct. They have also often been considered an option of last resort due to their hefty prices relative to the cost of the stencil itself, which, conversely, is 100% incorrect. While we are delighted to have many leading edge customers like Qualcomm use our technology on every stencil, all too often we hear “Oh, we use your nanocoating on hard to print boards” or “Yes we use your nanocoating on pitches .5mm and smaller.” The reality is that the self-assembling monomer (SAMP) nanocoating affords many more benefits to the stencil printing operation than simply release on small features. It has been shown to reduce wipe frequency, improve print definition and decrease variation in deposit volumes. 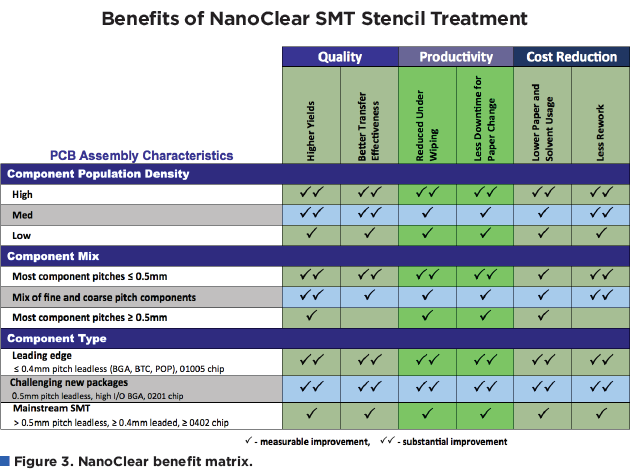 While some polymer nanocoatings can cost more than the stencil itself, NanoClear coatings cost PCB assemblers an average of $25 to $50 per stencil, depending on whether the users opt to apply it themselves or to have the stencil supplier do it for them. In most cases, the cost of the nanocoating can be paid back in hard savings in less than 200 print cycles alone. That payback does not take into account the increased capacity generated by less down due to less paper changes; nor does it consider the better print definition! So as quality guru Philip Crosby would say, “Quality is free”! The workbook, which is available for download from our website at www.aculon.com has two tabs. One calculates the costs of both simple and complex rework, and the cost per wipe of paper and solvent. The other calculates the payback and additional uptime. The numbers are all input directly by the user to allow them to play “what if” scenarios. The workbook is completely transparent; there are no locked cells, hidden formulas or assumptions. To use the cost estimator, begin with the Cost Calculator tab shown in Figure 1. “Simple Rework” is considered a repair that can be performed with hand tools like soldering irons, solder vacuums or wick. “Complex Rework” is considered a repair that requires a rework machine. Notice that machine cost is not included in the calculation because they vary among facilities, original cost and age. Only average labor, benefit and overhead rates are required. These figures can easily be accessed with a phone call or email to an operation’s accounting department. The time requirement for complex repair should consider the removal and replacement or shielding of nearby components, and the time to clean, redress and reprint pads, as well as reball BGAs and/or reprint area array devices. The average labor rate for complex rework is usually higher than that of simple rework because of the higher skill level required. The cost of paper and solvent, if not already known to the user, can be accessed by contacting either the purchasing department or the supplier. The stencil printing engineer using the spreadsheet should also know the length of the roll, advance length per pass, and number of passes in a wipe cycle. The length is written on the roll’s label, and the advance length and number of passes in a cycle are usually programmable parameters in the printer itself. The left column of the Savings Calculator sheet is broken down into three categories: Quality, Productivity, and Cost Reduction. In the Quality category, the user inputs the current first pass yields and the projected first pass yields. This presents an excellent opportunity to try different projections and instantly see the results. The user also inputs the percentage of defects that are simple and complex, using the same criteria as the Cost Calculator tab. Also similar to the Cost Calculator tab, the user inputs data in white cells and the calculated numbers appear in the yellow cells. The labor savings for reduced rework are shown directly beneath the Quality section. In the Productivity section, the user inputs the current number of prints before wiping and the projected number. The projected number may be based on NanoClear trials, or estimated. Estimates generally range from 2X for frequent wiping (every 1-3 prints) to 1.5X for less frequent wiping (every 10 or more prints). Again, multiple inputs can be tried to quickly assess the cost savings for different scenarios. The yellow cell shows the percent wipe reduction, and the savings per print are shown directly beneath the section. 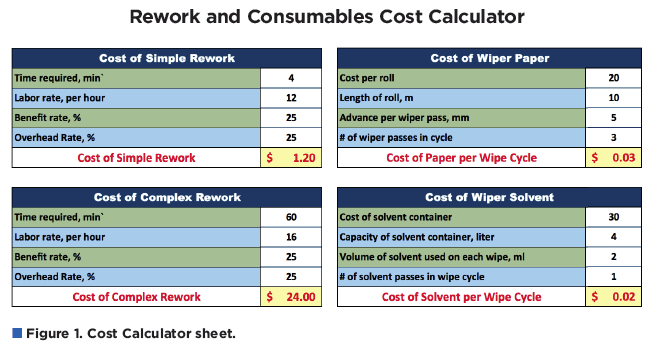 The Cost Reduction section requires no inputs; they are simply the calculations for labor and consumables costs that were determined on the Cost Calculator tab. They remind the user what figures resulted from the Cost Calculator inputs and were used in determining the savings in the previous two sections. The right column of the Savings Calculator requires just a few more simple user inputs: the cost of NanoClear and its application, if an application cost is anticipated. It uses the total quality and productivity savings per print to calculate the number of prints required to pay back the cost of the NanoClear and any associated application fees. The payback is generally within a few hundred prints. Finally, the Annual Savings section projects the yearly savings using the input number of prints per hour, number of production hours per week and the calculated savings per print. The “Bonus Section” – or the number of additional line uptime hours due to less wiper roll changes – is calculated from the inputs on the number of roll changes per week and the time required to change the roll. It is based on the concept that because the printer is the first process in the line, downstream processes stop and wait on a roll change to resume producing. Shea has three main comments on the creation of the calculator: “First, we needed to make it as simple and straightforward as possible, which is why we took machine cost out of the equations. Investigating asset values and depreciation schedules are usually beyond the scope of the traditional process engineering role. Of course, engineers can add these figures and calculations if they want to. “Second, we wanted to make it ‘currency-neutral’ to avail it to all regions of the world. While it is currently formatted in USD, it can easily be used with Euros, RMB, Rupees, Baht, or any other global currency unit. She continues to comment “The biggest challenge of the three goals was the first. Many cost calculations include equipment values and indirect labor reductions, which can present challenges to quantify. I consulted with an international manufacturing finance director on the topic and followed his guidance to remove these factors. Because the NanoClear has such a low acquisition cost, these inputs are really not necessary to realize a fast payback period.” Again, because of the straightforward nature of the spreadsheets, engineers can add these factors at their own discretion. A third tab in the workbook is a benefit matrix to help engineers estimate the improvements that NanoClear will afford their process (Figure 3). Like the calculation sheets, it breaks down improvements by quality, productivity or cost reduction. It classifies the level of improvement as measureable or substantial based on population density, component mix or component type. 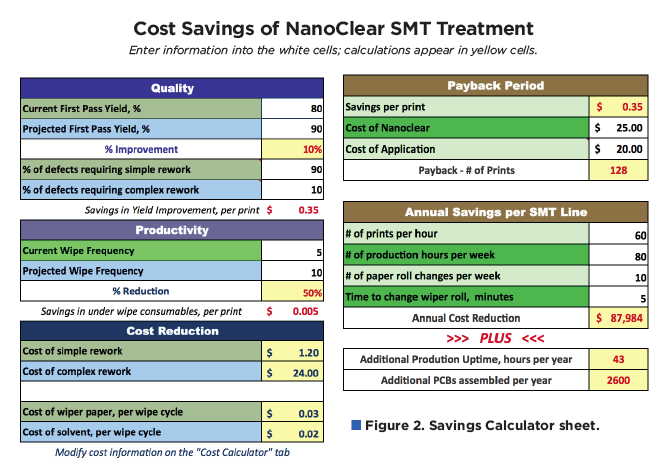 A final note on the NanoClear cost calculator is that it provides an excellent tool to help engineers cost justify other production items, like higher quality papers that don’t require as much usage, solvent wipes to improve print quality, and SPI systems or printer improvements based on defect cost. If the ability to reduce costs, improve quality and enhance productivity do not get an engineer on the nanocoating train today, then it is only a matter of time. SMT stencil technologies have always evolved in response to manufacturing demands. Sometimes the costs or “newness” of enabling technologies have slowed their adoption rates, but eventually they go mainstream. For example, it took a while for the industry to move from chemically etched to laser cut apertures, from generic stainless steels to specialty alloys, and from single thickness foils to multilevel steps, but the technologies all gained acceptance as they became more proven and less expensive. The earlier adopters enjoyed competitive advantages that the lagging, later adopters missed. SAMP nanocoatings aren’t new; they were first introduced over 5 years ago and have been used around the world to improve a broad variety of stencil printing processes. But unlike other process improvement technologies, they never required a back-breaking cost premium to improve performance. In fact, their low cost, ease of use and quantifiable cost savings has made them easy to adopt, and their popularity is growing on a daily basis. We encourage you run the numbers yourself, and we look forward to seeing you on the Nanocoating train very soon!